Take a bite out of Kelis’s latest album, Food, when the New York City singer hits L.A. on Wednesday, June 4. Released in April, the record draws its inspiration from the things Kelis, who’s also a chef with her own line of sauces, loves to eat: “Cobbler,” “Fish Fry,” “Biscuits ‘n’ Gravy.” It also conveys her desire to nourish listeners with touches of soul, funk, and Afrobeat. Local musicians like trumpeter Todd Simon helped make this album one of the best works the singer has released in some time. Her live band for the tour has given life to the new material as well as her hits from past recordings. 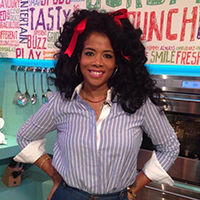 Click here for a chance to win a pair of tickets to see Kelis perform on Wednesday, June 4 at the El Rey Theatre. All entries must be received by Monday, June 1 at midnight.